150 years ago the Gold Spike was driven to commemorate the binding of our continent together. Come and celebrate! Need some ideas? Have you ever seen the Real American West? Plan a week-long road trip around the Golden Spike Territory. We put together a complete itinerary, including Salt Lake, Promontory Point, Ely, NV, and even driving on a portion of the original transcontinental roadbed. You can ride the Copper Spike Limited or one of the other excursion trains up Robinson Canyon toward the old Ruth Mining District and actually see the original copper spike. The Nevada Northern Railway is famous for real railroad experience - Hands On History experiences, such as running the steam locomotive out on the mainline, or being part ofRailroad Reality Week, or even sleeping the bunkhouse or caboose in the center of the East Ely Yard. 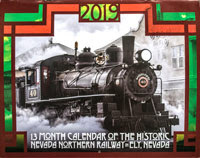 We will send one of our official 2019 Nevada Northern Railway calendars to each family that purchases train rides and/or a Hand-On-History events. 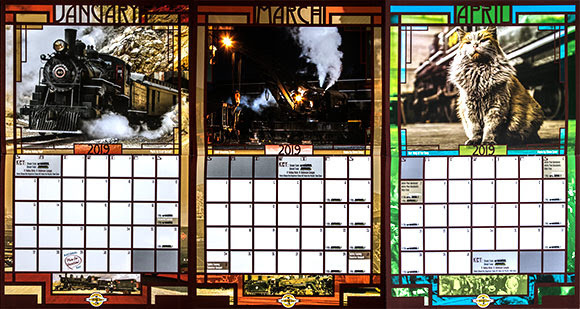 This calendar features full-size action-shots of most of our historic equipment, including Locomotives 40 and 91, and the wrecking crane. There is also a month dedicated to the official shop mascot, Dirt the Cat. If you don't buy tickets before February 4th to earn your free calendar you can still buy a calendar through our on-line General Store. The Nevada Northern Railway is a non-profit 501(c) historical foundation whose mission is to maintain and operate what has been acclaimed as the best preserved railroad facility on the continent. Come, enjoy history with us!